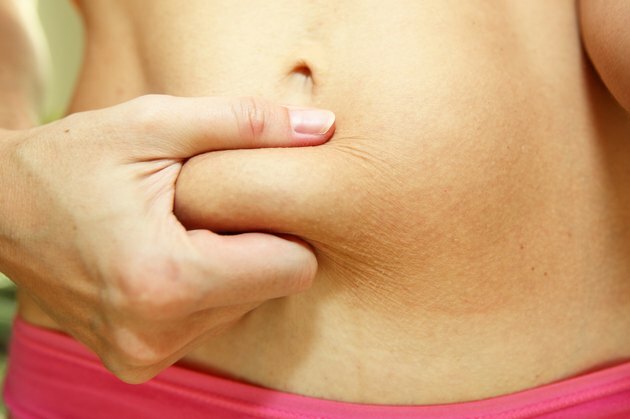 Loose skin is a common fear if you're trying to lose a significant amount of weight. Although excess skin cannot be directly tightened by exercise, if weight loss is done appropriately, you can eliminate or minimize the amount of loose skin you have once you reach your goals. The method you choose for losing weight significantly determines how much loose skin you have once you meet your weight-loss goals. With weight-loss surgery, you lose large amounts of fat very quickly, resulting in significant amounts of excess skin. Losing weight through exercise and calorie reduction causes you to lose weight slowly, making it easier for your skin to adjusts to your new body frame. Avoid fad diets that cause fast weight loss because they result in slowed metabolism, muscle loss and saggy skin. Exercise while reducing the calories you consume by about 500 to 1,000 calories per day to lose 1 to 2 pounds per week. Your skin has elasticity that allows it to bounce back to its original shape; however, there are factors that determine how capable your skin is of tightening as you lose weight. Your age is the biggest factor since your skin loses elasticity as you grow older. As you age, your body loses its bounce-back factor. Another important factor is how long you have been carrying the excess weight. Consider a rubber band that has been pulled and stretched for several years. If you suddenly stop stretching the rubber, it's unlikely to return to its previous shape. Strength training builds muscle, so this is the most important type of exercise for you to focus on while losing weight to avoid excess skin. Fat cannot turn into muscle, but muscle can replace the fat and minimize loose skin. You should strength train five times per week and avoid working the same muscle groups two days in a row because your muscles need time to recover between workouts. Cardio is usually the exercise of choice for many people trying to lose weight. Do not concentrate on long cardio routines while consuming smaller amounts of calories because this can cause you to burn lean muscle tissue, which is important for preventing loose skin. Only perform 30 minutes of moderate-intensity cardio five days per week, and spend a lot of your exercise time strength training. What Is the Best Thing for Firming Sagging Skin? Why Do I Look Flabby After Exercising?